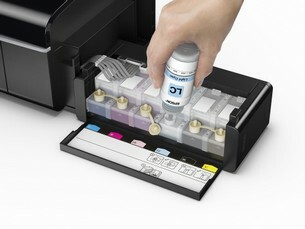 An integrated ink tank system delivers cost-effective photo prints. The ultra-high-capacity ink tank, utilising 70ml ink bottles, can print up to 1,800 quality 10x15cm photos for an ultra-low cost per page1. Refilling using individual ink bottles is quick and easy thanks to fast ink top-up technology, clearly labelled bottles and drip-free nozzles. 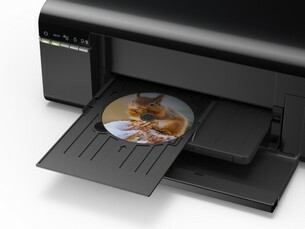 Primarily aimed at photographers, photolabs, advertising agencies, educational organisations and other users after an ultra-low cost per print solution for wireless photo printing, and printing onto CDs or DVDs. It's easy to increase productivity and reduce downtime with hassle-free set-up and reliable printing. Print a 10 x 15cm photo in as little as 12 seconds2, while the genuine integrated ink tank system with one year or 3,000 pages manufacturer warranty provides peace of mind. Wi-Fi connectivity and Epson Connect make printing from smartphones and tablets easy, while its compact, space-saving design makes it a great fit for most spaces. Expect quick-drying, smudge-free and consistent quality results from Epson's Micro Piezo technology and Epson genuine ink, which deliver prints with unrivalled durability, quality and reliability.